Explanation: In one of the brightest parts of Milky Way lies a nebula where some of the oddest things occur. NGC 3372, known as the Great Nebula in Carina, is home to massive stars and changing nebulas. The Keyhole Nebula (NGC 3324), the bright structure just above the image center, houses several of these massive stars and has itself changed its appearance. The entire Carina Nebula spans over 300 light years and lies about 7,500 light-years away in the constellation of Carina. Eta Carinae, the most energetic star in the nebula, was one of the brightest stars in the sky in the 1830s, but then faded dramatically. Eta Carinae is the brightest star near the image center, just left of the Keyhole Nebula. While Eta Carinae itself maybe on the verge of a supernova explosion, X-ray images indicate that much of the Great Carina Nebula has been a veritable supernova factory. The link to 'The Keyhole Nebula changing appearance' is showing as http://i.imgur.com/3BlMICY.jpg, which takes me to a picture of a cat! It initially showed as being to an APOD site, but immediately changed. Can you fix it, please? Thanks, Mike. 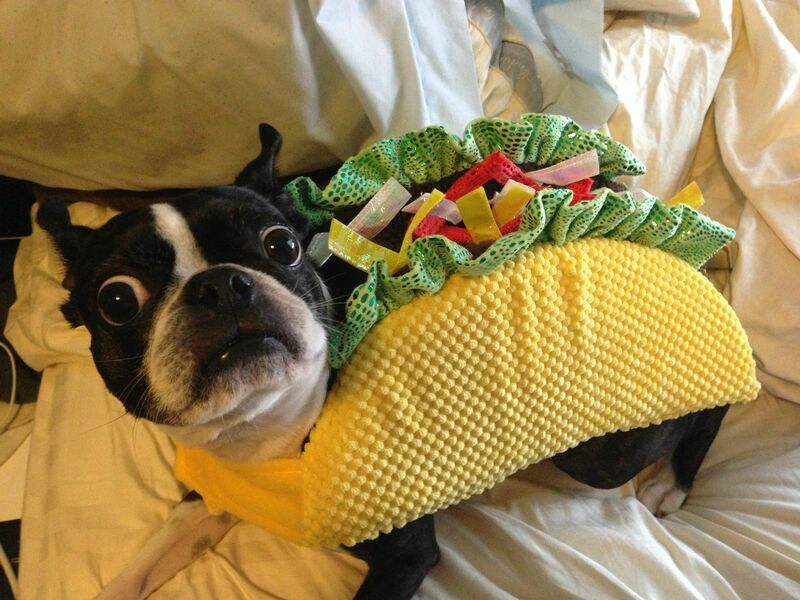 Now it's a dog in a taco suit! The link target is changing more than the keyhole nebula itself! It's always been a dog. It's supposed to be a dog in a costume. Bob likes a little levity from time to time. I was hoping someone could shed light on the apparent fracture in the Carina Nebula. It appears as if the Nebula was divided, much like continental drift divided Latin America and Africa. Is this an optical coincidence or are there forces in the Nebula that led to the fractured appearance that is evident? Dr Jekyll wrote: I was hoping someone could shed light on the apparent fracture in the Carina Nebula. It appears as if the Nebula was divided, much like continental drift divided Latin America and Africa. Is this an optical coincidence or are there forces in the Nebula that led to the fractured appearance that is evident? What may appear to be divisions within the nebula are most likely dark dust lanes in front as we see it that are obscuring the glow. However, the nebula most certainly would not be uniform in density, so possibly there would be areas that are brighter than others. Forces such as gravity and shock fronts from stars within the nebula also help shape its appearance. I thought of dust lanes, but they would have to form a remarkable 'check-mark' shape that I thought unusual or unlikely. It is also extremely difficult to obtain distances for each individual piece of a nebula, making 3d constructions of such objects a lot of guess work, though some things are clearly in front. Also keep in mind that the dust, while appearing to disappear at the edge, is only visually disappearing as it is a dark thing against dark space. Here's some IR light to shed on the Carina Nebula - https://www.eso.org/public/usa/news/eso1208/. The "fractures" or obscuring dust is invisible in IR. Ulsternaut wrote: Here's some IR light to shed on the Carina Nebula - https://www.eso.org/public/usa/news/eso1208/. The "fractures" or obscuring dust is invisible in IR. The dust goes from disappearing to glowing at longer wavelengths. 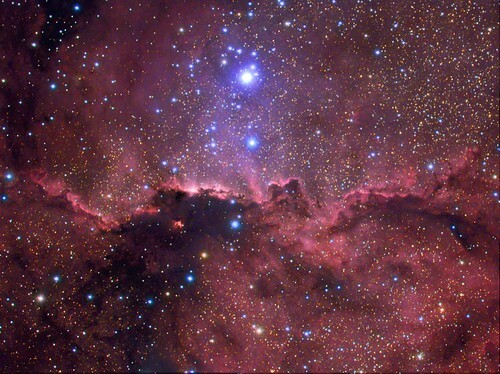 I can't seem to find a WISE mosaic of the nebula, though. The image above is very helpful in clarifying what we are seeing. I would be most interested in a IR of the elbow of the dust lane - just below the inset image above if anyone has access to that. MiketheTaxi wrote: The link to 'The Keyhole Nebula changing appearance' is showing as http://i.imgur.com/3BlMICY.jpg, which takes me to a picture of a cat! It initially showed as being to an APOD site, but immediately changed. Can you fix it, please? Thanks, Mike. Eta Carina or Car in a Eat Taco? Palindrome was the cat in the car caused it – Taco Cat strikes again!! All kidding aside Eta Carinae is a fascinating place. Nice imaging Damian!! The "V" in the Carina Nebula is just two walls of dust being eaten away by the ultraviolet light from the hot stars in the vicinity. Such walls are moderately common. 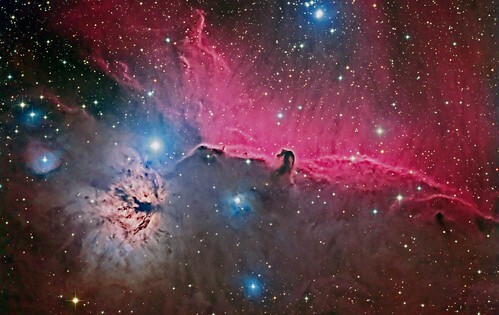 The "wall" from which the Horsehead Nebula is protruding, and the "wall" of NGC 6188 that the massive, O3-type star HIP 81696 is eating away at, are two examples. In the explanation it states "The Keyhole Nebula (NGC 3324)". However, in the information brought up through the Keyhole Nebula link in that it states "The Keyhole does not have its own NGC designation. It is often erroneously called NGC 3324, but that catalogue designation refers to a reflection and emission nebula just northwest of the Carina Nebula (or to its embedded star cluster)". I'm confused therefore as to what NGC 3324 does refer to. NGC 3324 is a star cluster, together with the associated emission and reflection nebulosity, at the northwest corner of the Carina Nebula (NGC 3372, home of the Keyhole Nebula and star Eta Carinae). I have been thinking about something since this image was the Astronomy Picture of the Day, and that is how large and impressive-looking the Carina Nebula is, yet how lacking it is in compact, rich, massive star clusters. The most compact bright cluster in the Carina Nebula is NGC 3293, and that cluster is even outside the really bright part of the Carina Nebula. By contrast, Trumpler 14, the most compact young cluster in the central part of the Carina Nebula, looks quite poor. 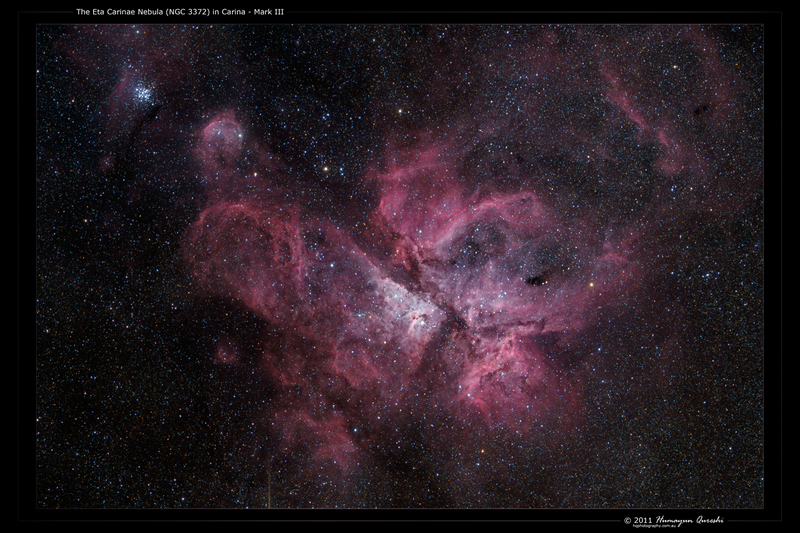 In this large, 1.4 MB image, you can see NGC 3293 at upper left, and the whole Carina Nebula complex at center. NGC 3293 is very obvious in this image, but Trumpler 14, located in the brightest part of the nebula just below the long broad dust lane running diagonally from upper left to lower right, is inconspicuous. Ann wrote: I have been thinking about something since this image was the Astronomy Picture of the Day, and that is how large and impressive-looking the Carina Nebula is, yet how lacking it is in compact, rich, massive star clusters. I think Trumpler 14 is moderately rich? The ESO image you linked to is slightly poor. It looks better in this image by Don Goldman. I think Trumpler 14 is moderately rich? You are right about that. It certainly doesn't look so rich to me, but apparently, it is. Credit: NASA & ESA, Jesús Maíz Apellániz. Trumpler 14 looks richer in this HST image than in the ESO image in my previous post. 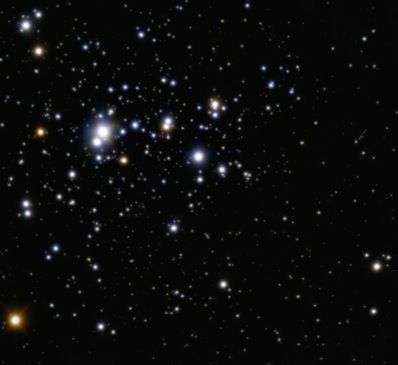 A huge number of small orange stars are visible. As for the unimpressive appearance of the cluster in the ESO image, maybe the brilliantly luminous supergiant HD 93129A makes the other O and early B-type stars look kind of faint. This is a mistake that has been repeated in previous APOD's of the Eta Carinae Nebula. The Keyhole Nebula has no catalogue number and NGC 3324 is a completely different nebula that is outside the main central Eta Carinae Nebula area.